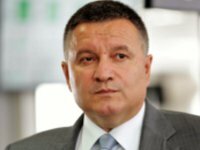 Security has been tightened in Ukraine in the light of the explosions in the St. Petersburg metro on Monday, Ukrainian Interior Minister Arsen Avakov said. "Security has been tightened," the Interior Ministry press service quoted Avakov as saying. An explosion occurred in a train car in the St. Petersburg metro between the stations Sennaya Ploshchad and Tekhnologichesky Institut. According to the National Anti-Terrorism Committee (NAC), nine people were killed and over 20 were injured.